He retired following throat surgery after he was diagnosed with cancer. Match of the Day presenter Gary Lineker tweeted: "A voice we all know, the voice of the football results, James Alexander Gordon has died. Tottenham Hotspur 1.. Newcastle United 1.. #RIP"
Nicknamed 'Jag' because of his initials, Gordon attracted an army of followers with his distinctive Scottish accent and unique style of delivery. He would alter his tone of voice to indicate whether a result was a home win, an away win, or a draw. Richard Burgess, head of BBC Radio Sport, said: "James was an iconic radio voice, who turned the classified football results on BBC radio into a national institution. "He was also a true gentleman, who was loved and admired by his colleagues. "He took enormous pride in his work and I know he was greatly touched by all the tributes he received upon his retirement last year." 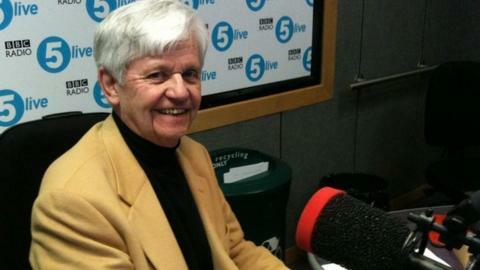 "5 Live and the football results have lost a friend today," said Armfield. "I can remember before I joined and he came to the BBC that the style was more regimented. He put a different slant on to it. He went up with the voice and down with the voice. "He seemed to pitch it just right. He did it all with perfect enunciation. That lovely voice, with the little trace of Scots in it, with the highs and lows. He knew when to lift it and put it down. "He really was something special. People used to mark the pools coupon with the football results. James knew that. He always gave them time to find out whether it was 1, 2 or an X for the football pools. "It wasn't the same picture at all when he started out. There was no satellite broadcasting. Matches weren't shown as they are now. Everything came down the line on the radio. He was the first point of contact for who had won. James knew it all. He had it all weighed up. He was the consummate professional." Mark Pougatch, as a presenter of Radio 5 live's Saturday tea-time show Sports Report, introduced Gordon on many occasions, and tweeted: "It was a honour to say your name on so many Saturdays Jag. Tonight it's Heaven 1 Earth 0." Barnsley fan Matt Bailey: "Always loved the way James Alexander Gordon said Barnsley nil. RIP a great broadcaster." Comedy writer Daniel Maier: "RIP James Alexander Gordon - with Peel and Postgate as one of the defining, reassuring voices of my youth." MOTD commentator Steve Wilson: "Death of James Alexander Gordon is very sad. Turned what was small chore on a broadcaster's rota into an art form. Never been bettered." Fulham supporter Henry Walmsley: "RIP James Alexander Gordon. One of the voices of my childhood." West Bromwich Albion and England goalkeeper Ben Foster: "RIP James Alexander Gordon. Saturday afternoons checking Teletext and listening to the footy scores was the best." Comedian Sue Perkins: "East Fife 4 Forfar 5. RIP James Alexander Gordon, voice of my childhood x"
Ipswich fan Chris Bolton: "As much to do with my love of football as my Grandad... 'And now; today's classified football results, read by James Alexander Gordon'." Chelsea FC: "Rest in peace James Alexander Gordon, who was the voice of football in Britain for many years." Comedian David Schneider: "A Voice Guaranteed 2 Be Remembered By Every 1. RIP James Alexander Gordon." Former Liverpool and Republic of Ireland defender Mark Lawrenson, now a BBC analyst, told BBC Radio 5 live: "When James Alexander Gordon started, there were nothing like the same outlets. There weren't 10 reporters at every game. Sometimes you had to wait until James Alexander Gordon for the definitive result." BBC Radio 5 live's senior football reporter Ian Dennis added: "For a generation of football lovers, James Alexander Gordon's voice was Saturday afternoon for the complete picture. You heard the theme tune for Sports Report and then you heard his voice." Gordon's legion of followers included comedian Eric Morecambe - on whose early-career radio show Gordon had been an announcer. In a 2012 interview, Gordon said that Morecambe always greeted him with a famous tongue-twister scoreline involving Scottish sides East Fife and Forfar - one which never happened, yet became closely associated with the BBC's voice of the classified football results. "Eric never called me James," Gordon recalled in 2012. "Whenever I saw him over a 20-year period, he would say 'East Fife 4 Forfar 5'. I've got a tape of that." When Morecambe died in 1984, Gordon received a tribute from the comedian's wife, Joan. Eric (Morecambe) never called me James... he would say 'East Fife 4 Forfar 5'. "After his funeral, his wife said there was only one thing she would like to have had - me saying 'East Fife 4 Forfar 5'," said Gordon. "It was quite sweet." Gordon, born in Edinburgh in 1936, contracted polio when he was six months old and spent much of his childhood in hospital. He worked in the music business before moving into radio, promoting artists such as Bert Kaempfert and James Last. In 1972, he joined the BBC, reading the news and presenting various programmes on Radio 2 - even Newsbeat on Radio 1 - before he began reading the classified football results in 1973. At the time, he was a BBC Radio 2 staff announcer and revealed in 2012 that his chance to read the football results came unexpectedly after being summoned by his boss. "He came in and said: 'Jag, footy,'" Gordon recalled. "I said: 'I beg your pardon?' He said: 'Jag, footy.' I wondered what the heck he was talking about. It was the football results." As he sat alone in a dimly lit room at BBC Television Centre in London contemplating the task ahead, he came up with a style of reading the football results that was to become his trademark. "I trained as a musician and I think music had a lot to do with the way I read them. I looked at these names and thought, unkindly, five minutes of that could be very boring for the listener. I thought it would be nice to make it a little different, with a bit of excitement. "So I had a dummy run. There were no numbers, but I thought: 'Arsenal have lost and I feel really sorry for them. Manchester United have won and I'm over the moon.' I wasn't a Manchester United fan, I was just working it out." "I was terrified at first, but I put my heart and soul into it and have loved it ever since. "Such fun getting it right. The most important thing, though, has been making it exciting for the listener." Having been diagnosed with cancer, Gordon had surgery in 2013 to remove his larynx, which meant his voice was no longer strong enough to broadcast. He was replaced by former Radio 4 newsreader Charlotte Green. Gordon, who lived in Berkshire, was married to Julia, with a son, David, and two grandchildren, Molly and Martha.